The #11 Mechanical Bender is designed for heavy duty production applications. The Mechanical Bender has a direct drive free of chains, sprockets, gears, or electric brakes; therefore minimal maintenance is required. 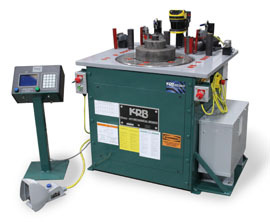 With infinite speed adjustment, the KRB #11Mechanical operates safely and efficiently. KRB Bender Head 2000 controller has 9 bend stations, set up by either numeric counts or by degree of bend angle, 99 memory storage locations, encoder and home switch error detection. KRB BCD Table Bender controller is capable of downloading from a host computer or the shape can be scanned from a 2D bar code. This unique controller will actually show the dimensions for setting up the bends. In other words, it shows the chalk mark for the proper bend location. This eliminates test bends and minimizes set-up time. This control also makes a perfect training tool for new bender operators.